On top of my meals at Opal by Gordon Ramsay at The St Regis Hotel and Blue at the Grand Heritage Hotel, I also managed to squeeze in some Italian and some Lebanese food whilst in Doha – all in the space of some 52 hours. Yes it was an extraordinary amount of eating, but I assure you that I did try and work this off with walks along the Corniche and around Doha’s main market, Souq Waqif!! 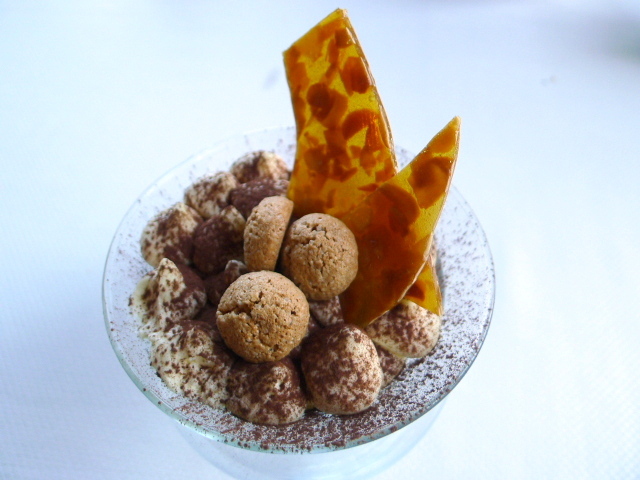 My Italian experience was at Il Teatro Restaurant which is part of the 5-Star Four Seasons Hotel. We went for Sunday lunch which proved to be a very quiet experience as Sunday is the start of the working week in Doha. Il Teatro serves upscale contemporary Italian food in a classically decorated dining room that can only be described as sumptuous. The restaurant backs onto the pristine gardens of the hotel and there is also some outdoor seating. 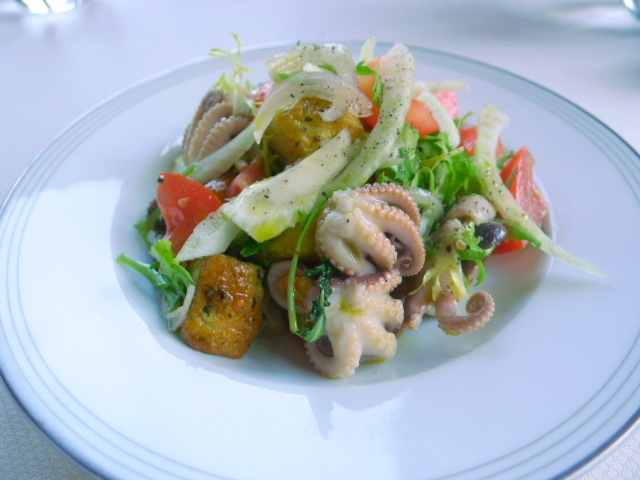 From the starters, the baby octopus in a panzanella salad with focaccia croutons, fennel, tomato and onion was tender and tasty. The leaves were fresh and nicely dressed but were quite cold from having come straight from the fridge. The croutons detracted from this salad as they had not been freshly prepared and were unfortunately stale. An eggplant Parmigiana was lovely and oozed with lots of cheesy, tomatoe-y goodness, the combination of which melded nicely with the softness of the well-cooked eggplant. 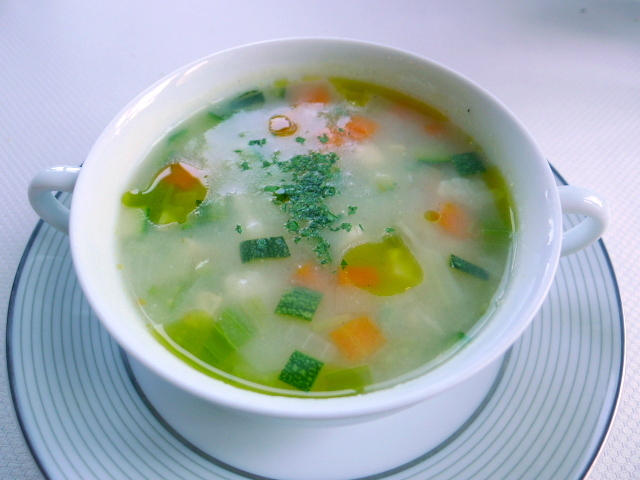 We went onto soups next, and a lentil and celery with rosemary was tasty with delicate floating notes from the herb, but a minestrone soup with extra virgin olive oil disappointed. Rather than the traditional tomato flavour permeating as the basis of the stock, the broth was very potato-y. The result was something very starchy in texture and taste, rather than a soup that was sweet and fresh. Homemade gigli with seafood and fresh tomato boasted of a sauce that was resplendent with tomato flavour. It was fresh, inspiring and very delicious. The seafood was a combination of finely chopped pieces of calamari, fish and prawns, all of which were nicely cooked. 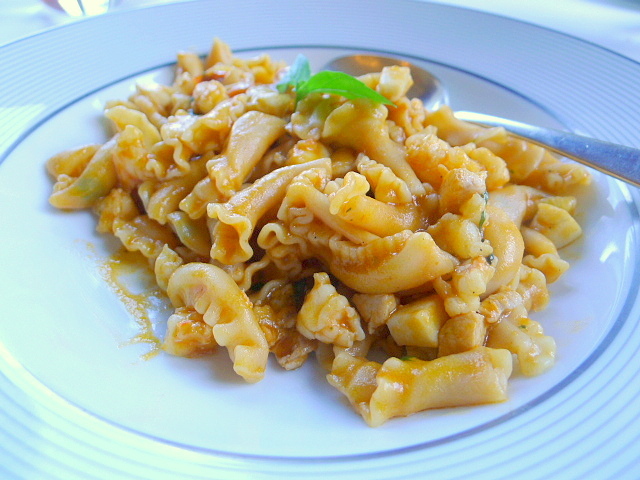 The gigli pasta showed skill in its making and was also very tasty, although it could have done with a little less cooking for a bit more of an ‘al dente’ bite. Finally more care should have been taken to serve the pasta on a hot rather than a cold plate as the dish went cold very quickly. 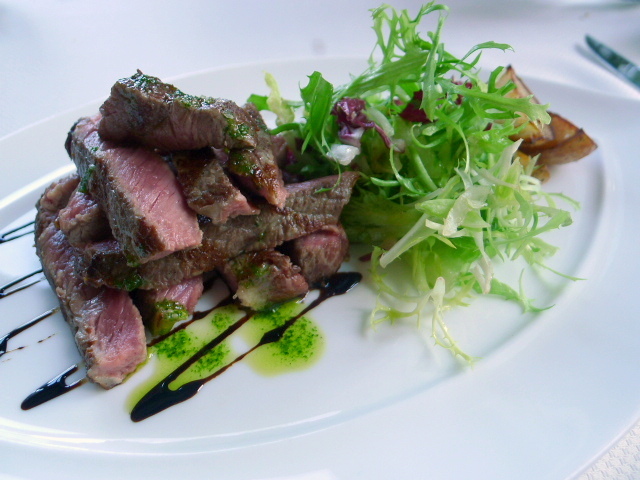 A main of grilled beef “tagliata” with herbs, parmesan shavings, balsamic drizzle and roasted potatoes was cooked to the requested medium rare. There was good flavour in the steak, but it was a touch chewy and not as tender as one might have expected. It was also difficult to detect the herbs or the parmesan on the beef. Overall, it didn’t quite come close in either quality or taste when compared to the steak that I had at Blue. 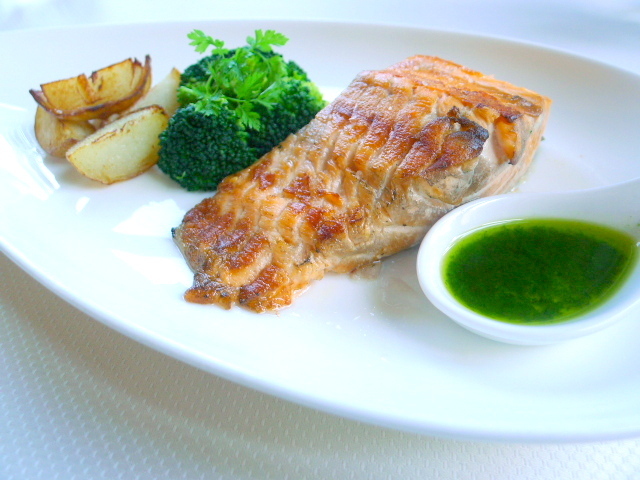 A grilled salmon fillet was fresh but a little dry. 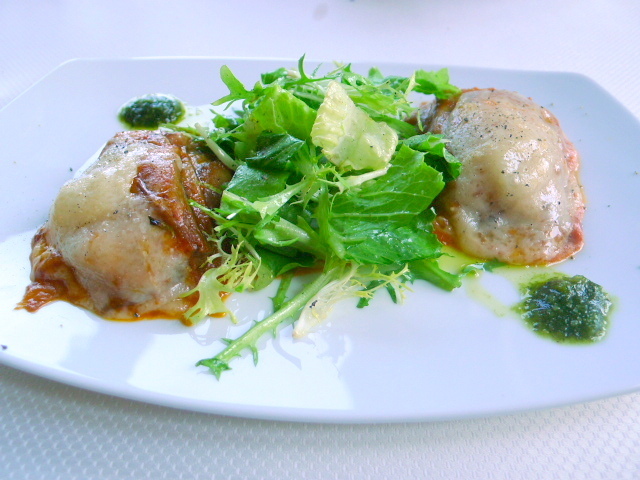 The accompanying salmoriglio sauce was tasty and aromatic from the use of the herbs and well-judged for acidity. To desserts, and a classic tiramisu was very pleasant although a touch more alcohol would not have gone astray. 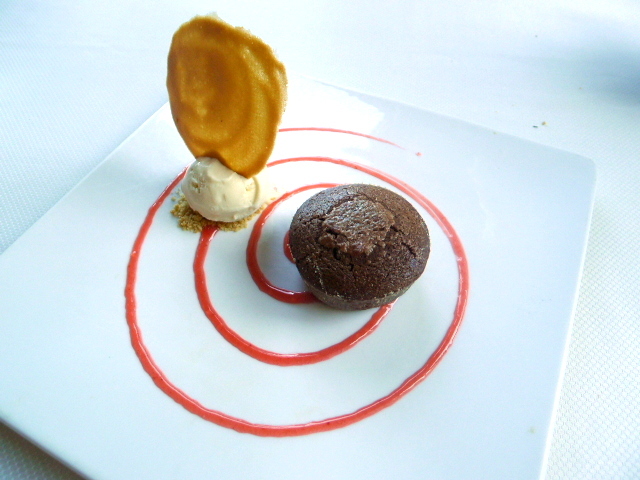 The bake on a chocolate fondant served with vanilla ice cream was very good, leaving the fondant with a luscious runny centre. There were some good points to this meal which demonstrated a reasonable showing of skill. Some dishes resonated with appealing flavours, most noticeably in the more classic Italian dishes such as the Parmigiana and the pasta. But there were some tardy points too – stale croutons and cold plates were rather unexpected for a restaurant at a 5-Star Hotel of this caliber, and were entirely avoidable. The service was excellent, and more attention on the finishing touches to the food could have helped to elevate this overall experience. 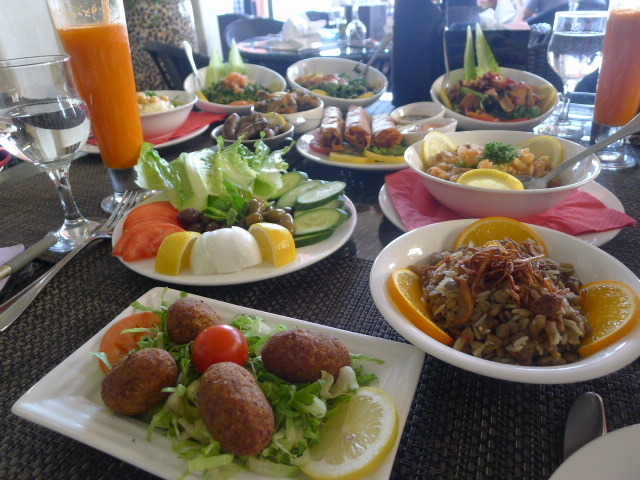 For something more Middle Eastern, or more specifically Lebanese, we headed to Al Mourjan restaurant on the Corniche for a spot of lunch. Al Mourjan has won a string of accolades including The Qatar Choice Awards for the Favourite Arabic Restaurant of 2012. There are two branches of Al Mourjan. One is in Souq Waqif, and the other has pride of place right on the corniche with views looking out onto the Persian Gulf. It is too hot to sit outside the restaurant during the summer days, but at night the temperatures cool to a point where an outside table becomes possible. The restaurant also has an enclosed terrace area which is air-conditioned, and of course there is the dining room inside the restaurant itself which is decorated to a traditional taste. We tried a variety of mezes with the intention of moving onto some mains, but the portion sizes of the mezes were massive and so we never got that far. 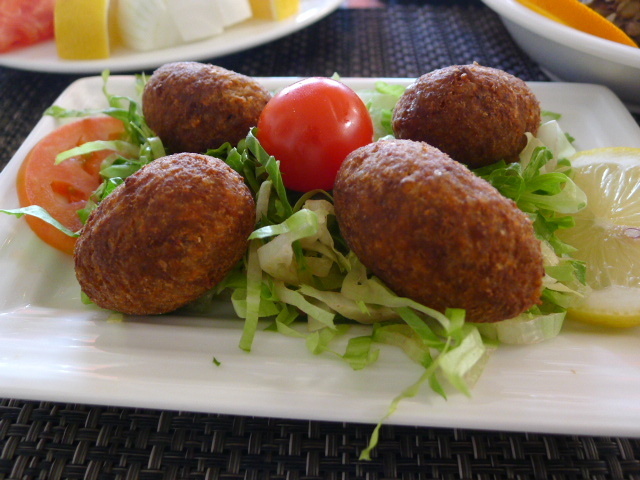 Think of the size of the mezes you get on Edgware Road, and these were at least two to three times as large as those. They were perfect for groups of four or more, but for smaller tables of two to three people, the option of half size portions would have ideal. The menu choices were extensive with about 100 different types of meze. From the salad selection we tried the fattouch, tabbouleh and zaatar (thyme leaf) salads (all QAR35 – about £6.30), all of which were resoundingly fresh. 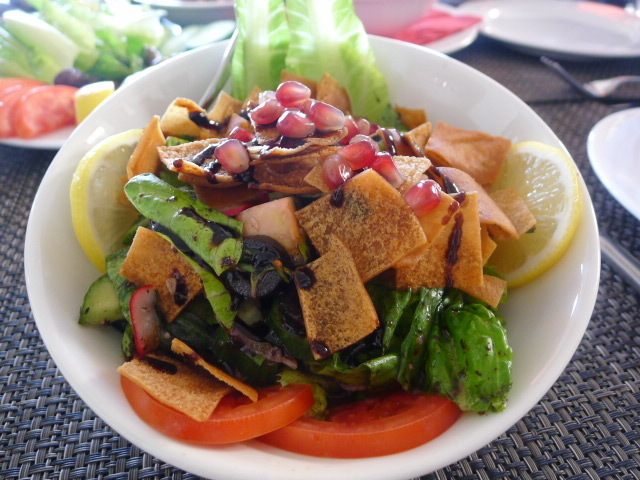 Fattouch is always great with some crunchy pieces of toasted pita bread to give it that textural contrast, and here it was no different. 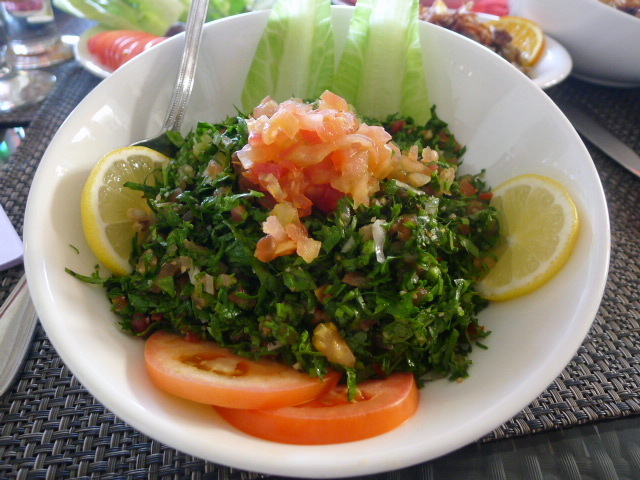 The tabbouleh was particularly delicious with the parsley being very fragrant. It had also been expertly chopped such that the leaves still held onto their body, and hence their flavour. 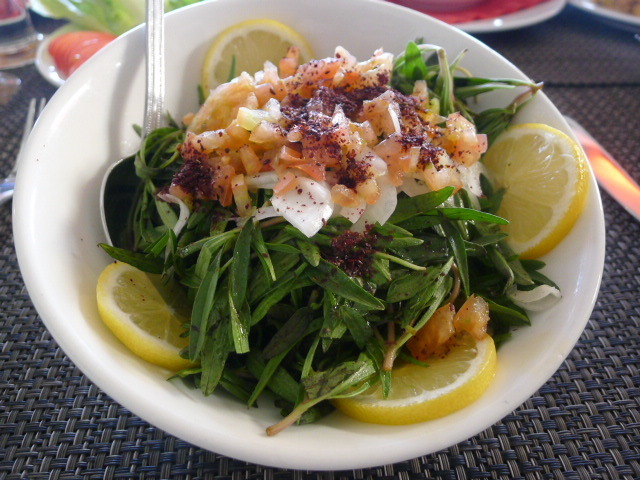 In a testament to its freshness, the zaatar leaves were quite strong in taste and of good quality. All the salads were quite lemony, but this seems to be in keeping with Middle Eastern palates. 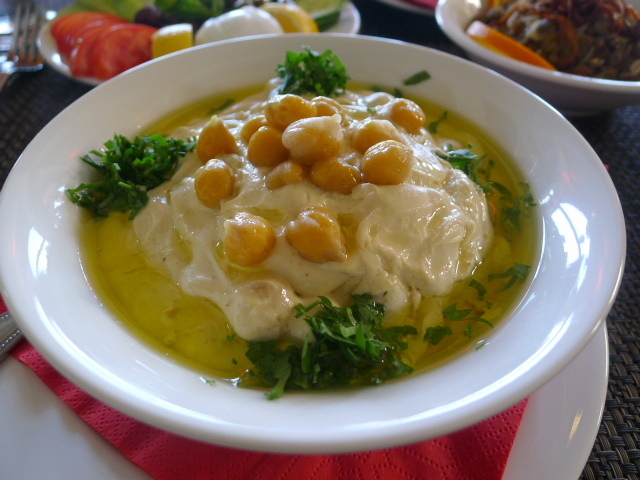 Classic mussabaha hummous (QAR40 – about £7.20) made with both chick peas and pine nuts was delicious with a hint of lemon. The texture was divinely smooth and creamy with a light and airy consistency. 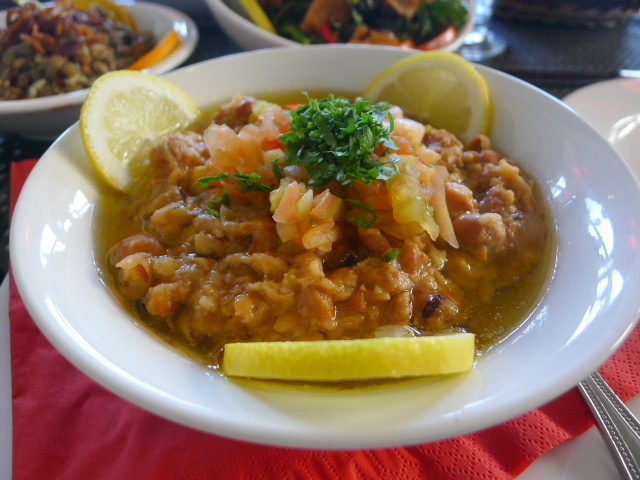 A classic Lebanese dish of ‘foul’, a fava bean stew (QAR45 – about £8), was flavoursome and hearty. 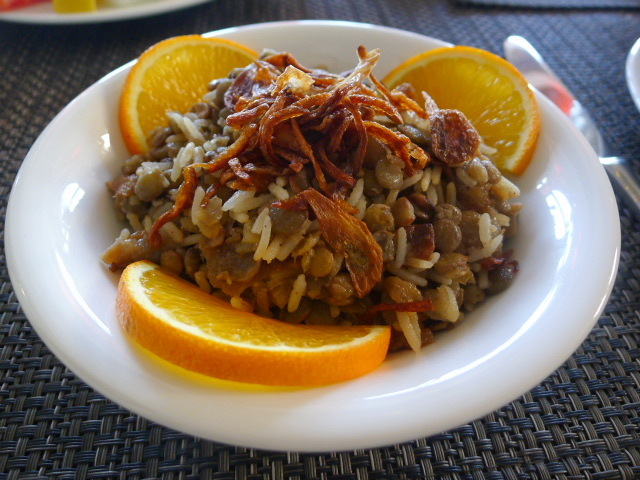 A moudardara (QAR30 – about £5.40), a dish of lentils, rice and caramelised onions was wonderfully tasty from the use of chicken stock. The onions added both sweetness and a lovely crunchiness to the dish. 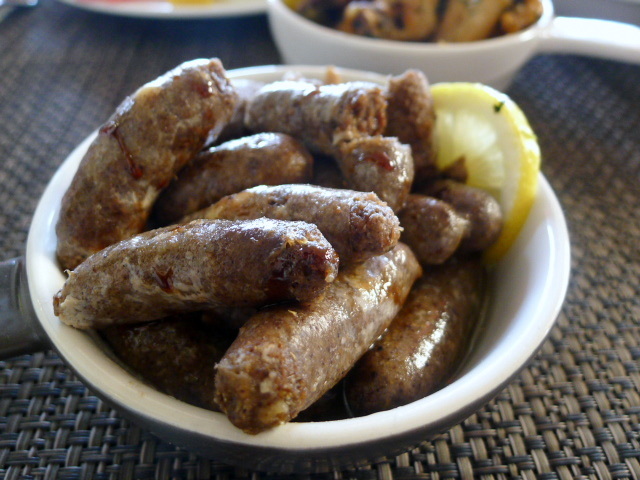 We didn’t think much of the meaty mezzes however as the chicken wings (QAR40 – about £7.20), kebbeh (QAR35 – about £6.30) and Lebanese sausages (QAR35 – about £6.30) all tasted as if they had been pre-cooked and re-heated. Consequently they were a little dry and lacklustre with that ‘day old taste’. 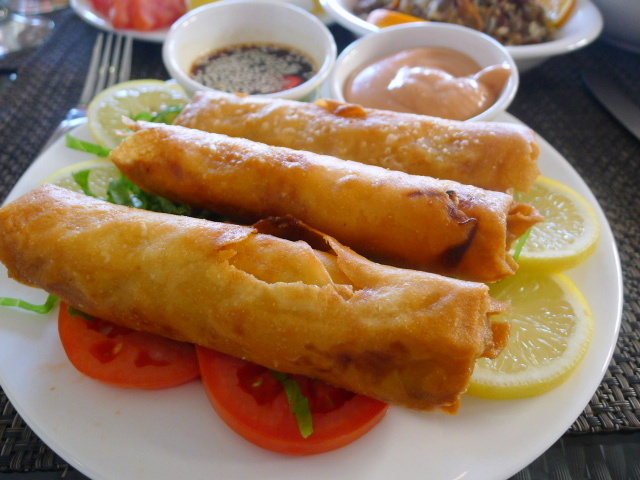 But the shrimp rolls (QAR60 – about £10.80), resembling a large spring roll, were super yummy. There wasn’t much shrimp in the filling which was disappointing, but the mixture, consisting predominantly of shredded cabbage and carrots, was soft and nicely seasoned. Freshly fried, the pastry was also crispy. 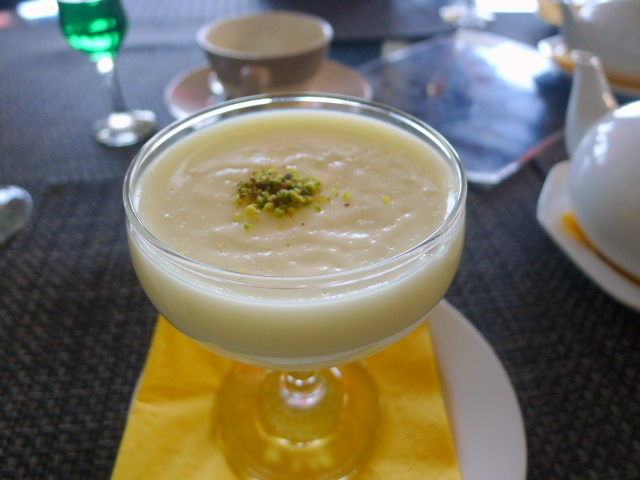 A dessert of mohalabya which is similar to a set custard, was light, creamy and well-judged for sweetness. Topped with pistachios, the use of rosewater in the pudding gave it a lovely flowery freshness. Al Mourjan is a dry restaurant so there is no alcohol available, but there was a reasonable assortment of soft drinks and juices. The carrot juice (QAR35 – about £6) was really yummy, and you can try a good range of shisha (QAR45 – about £7.80) flavours such as strawberry and cocktail (a fruit mix). 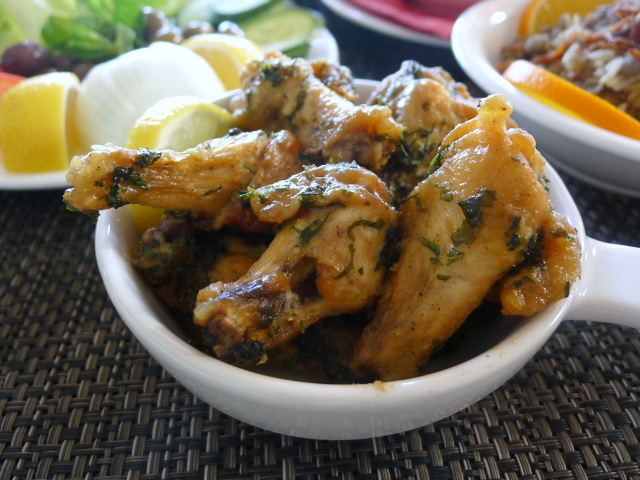 The service was fine and on the whole the experience of Al Mourjan was fairly enjoyable for the salads and the hot vegetarian mezes. The meat based mezes disappointed however, but I suspect on a good day these might be quite yummy.